An agreement in principle outlines the integration of SFTS into a new U of R graduate school—the Graduate School of Theology—and establishment of a campus (above) in the Bay Area that will host programming from both institutions. In the wake of the announcement about an Agreement in Principle between the University of Redlands and the San Francisco Theological Seminary (SFTS), here are answers to some frequently asked questions from the Redlands community. The San Francisco Theological Seminary (SFTS) is a multi-faith seminary, founded and based in the Reformed tradition with historic ties to the Presbyterian Church. The SFTS campus is located in San Anselmo, Marin County, in Northern California, just north of San Francisco. About 225 students (including auditing and part-time students) are currently enrolled in its programs, which include Master of Divinity, Master of Arts in Theological Studies, and Doctor of Ministry degrees. SFTS includes the Shaw Institute for Spiritual Care and Interreligious Chaplaincy and the Applied Wisdom Institute of the Center for Innovation in Ministry. SFTS is a founding member of the Graduate Theological Union (GTU), which brings together scholars of the world’s religions and wisdom traditions from more than 20 schools, centers, and affiliates and offers a Ph.D. with member campuses in the consortium. Because SFTS is a member of the GTU, its students and faculty have access to a range of interdisciplinary and multi-faith resources, including classes at UC Berkeley and the library at the GTU, which is part of UC Berkeley’s Bancroft Library. Why SFTS? What is the rationale for the proposed partnership? A partnership between U of R and SFTS will enhance the academic mission and student experience at both institutions, expanding academic programming and creating pathways for students. The proposed association aligns with U of R’s strategic plan, North Star 2020. The partnership will build on the two institutions’ many shared values and interests, including commitment to teaching, scholarship, and community. Collaborative activities between U of R and SFTS already include a recently launched certificate in mental health counseling program. This venture, from U of R’s Schools of Education and Continuing Studies and SFTS’s Applied Wisdom Institute, offers community leaders the opportunity to enhance their skills in promoting mental health, providing spiritual care, and facilitating community engagement. Over the past year, SFTS and U of R have been exploring the possibility of a partnership—one that enhances the similar missions and traditions of each institution and creates unique collaborations between the two. The agreement in principle outlines a plan for U of R's acquisition of SFTS to achieve this transformative partnership. What are specific potential benefits for the University of Redlands? Acquisition of a one-of-a-kind regional campus property at which to host U of R School of Education and School of Business cohorts (with new capstone opportunities for the latter), conferences, and events, as well as, eventually, programming for College of Arts and Sciences and School of Music students (e.g., May Term, First-Year Journeys). As outlined in U of R’s North Star 2020 strategic plan, the University is committed to exploring and expanding academic and career pathways, connecting students to a world of opportunity. Through this action with SFTS, many tangible assets and strategic benefits will be realized at practically no cost to the University. What is in it for SFTS? To thrive in today’s landscape of higher education, a proven model for standalone seminaries is to embed within a larger, financially sound university. By becoming a part of the University of Redlands, SFTS expands its access to students in Southern California (especially the fast-growing inland region), who may be attracted to an SFTS-inspired education with a connection to the Graduate Theological Union. The partnership will also dramatically expand the seminary’s ability to offer interdisciplinary degrees and certificates in creative, new combinations with U of R’s academic programs and other educational resources. Is U of R becoming a Presbyterian school? No, U of R will remain a nonsectarian university. Will SFTS remain a Presbyterian seminary? Within the new U of R Graduate School of Theology, SFTS will continue as a multi-faith seminary, founded and based in the Reformed tradition with historic ties to the Presbyterian Church. Is the U of R expanding to Northern California? Yes, one of the core benefits for U of R is that a partnership with SFTS provides the University with an expanded footprint in Northern California and an eighth campus that can serve as a new venue for expanded educational programming. What is the structure of this partnership? 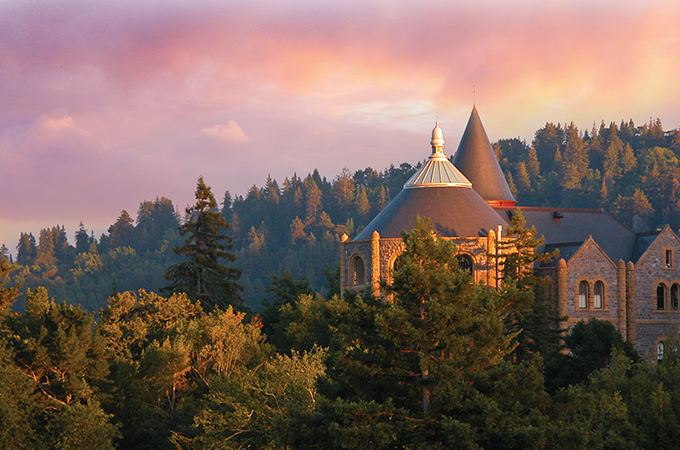 If finalized by July 2019, SFTS in Marin County will become embedded in the U of R, under a new U of R Graduate School of Theology. The campus itself will serve as a U of R regional campus, like the University's other regional campuses, in this case serving Marin County, San Francisco, the Peninsula, Oakland, and surrounding regions. The vision of the campus is as a new site for programs, initially of the School of Education, School of Business, and School of Continuing Studies and collaborations of many kinds with the new Graduate School of Theology. This partnership would in some ways be similar to the management of U of R’s international campus in Salzburg, which is handled on-site (in Salzburg) as well as in Redlands. Further, the new Graduate School of Theology can offer programs and degrees at our many campuses in Southern California. Will this partnership impact my job at the U of R? Having a new regional campus may slightly expand the scale (number of students or employees), but not the scope of responsibilities for certain centralized functions such as human resources, the business office, accounting, and the registrar. Will U of R’s degree offerings change? U of R’s current degree programs will remain the same, but new programs will be available to current and future students. What other partnerships or acquisitions have been contemplated? The transaction with SFTS is the only one on this scale that has been considered by U of R leadership. U of R is constantly exploring other bilateral academic exchanges (not corporate mergers), such as those that already exist with Western University of Health Sciences, Loma Linda University, Cal State Fullerton, College of the Desert, Crafton Hills College, Tuskegee University, and the Kyiv National Economic University (Ukraine). Will this partnership divert resources from other U of R academic initiatives and divisions? No, all the financial projections by U of R's outside consulting experts predict that the new U of R Graduate School of Theology will be self-sustaining and will even enhance the creditworthiness and financial stability of the U of R. The U of R’s bond rating is predicted to improve as the result of this change. Isn’t SFTS failing financially? If U of R sometimes struggles to make enrollment revenue goals, why is it taking on another institution’s debt? Many tuition-dependent institutions of higher education have difficulty consistently attracting the required numbers of students who seek the particular student experience and career pathways they offer. SFTS and many other independent seminary-based graduate education institutions are no different. While the University assumes SFTS’s debt, this is more than offset by substantial tangible assets and other benefits, which will be realized immediately and over time. These include a significant endowment, a valuable property, current tuition-paying students whose numbers are expected to grow through establishment of the broader Graduate School of Theology, endowed faculty scholars, and access to a major new market. I’m a donor. Is my support still going to the U of R and my chosen designation? Yes, gift designations and gift policies for the U of R remain unchanged. I’m an alumnus. Is my alma mater changing? The University’s mission and values remain solid and unchanged. U of R is expanding programmatically and geographically, both to strengthen and diversify financially and to enhance Redlands students’ pathways and experiences, per the University’s North Star 2020 strategic plan. What are the next steps in the merger? The finer details of the transaction are continuing to be worked out, and the process of securing approval from educational accreditors is needed. The transaction is anticipated to be complete by this coming July. If you are a member of the U of R faculty, staff, or administration, you are invited to the President’s Annual Forum, on Wednesday, February 27, at 3:30 p.m. in the Orton Center on the Redlands main campus. Faculty will have additional opportunities to discuss this announcement beginning with the next University Academic Assembly on Friday, March 15 at 3:30 p.m. For students, a forum will be held sometime in March, on a date to be selected by student leaders and deans. Readers should also stay tuned to the Bulldog Blog for more information as it becomes available. Additional questions can be directed to communications@redlands.edu.